Margot McLaughlin has over 40 years' experience as a singer and conductor. She studied Music, Education and Languages at the NSW Conservatorium of Music and Sydney University, and Psychology and Spanish at Macquarie University. 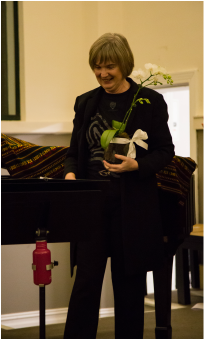 One of Sydney’s most respected choral conductors, Margot directed Macquarie University Singers from 1987 to 2008, and has worked with Sydney Philharmonia, Bel a cappella, the Australian Philharmonic Orchestra, Ku-ring-gai Philharmonic Orchestra and Willoughby Symphony Choir. Currently she is Musical Director of the seniors’ choir Beating Time, Associate Musical Director of chamber choir Coro Innominata, and is Founding Artistic Director of Coro Austral. She also works as a Freelance conductor and singer. ​Margot is constantly seeking and discovering new insights into Iberian and Latin American music.